Hi, I am interested in your 1974 Cadillac Eldorado (stock #4687-ATL) listed on Autotrader for $18,995. I'd like to get more information about this vehicle and confirm its availability. Sure, plenty of ultra-cool cars came out in the mid-70s, but few were anywhere near as cool as this 1974 Cadillac Eldorado Convertible. This bona fide land yacht is running strong - theres plenty to indicate its received recent maintenance - and offers a great foundation for restoration to transform it into a truly stellar ride. Clad in black, with a fresh red vinyl convertible top on board standing by to protect you from the elements, this is a car that demands attention. In true vintage Cadillac tradition, its one lengthy cruiser (especially for a coupe) and harbors all those styling cues the model was known for during this era, from the pair of dual twin headlights bracketing the signature front grille to the stretches of trim running along the sides - that themselves are longer than many cars - on back to the refined tail fins. The paint could use a freshening up, and the array of exterior fittings would benefit from a trip to a re-plating shop, but theres no doubt that this is a head-turner in its present state - and just imagine what it could become. Whether you drive it as is or decide to step things up, this Eldo has plenty going for it, besides of course its inherent coolness. Its body alignment looks solid and that convertible top powers into place without a hitch with the flick of a switch. Open one of the sizable doors, climb on in and youll immediate get a sense of the magic this car has offered through the ages. Its generous proportions translate into a spacious interior, with tons of shoulder room and plenty of rear legroom and, while you can see signs of aging on the bench seating, both the front and back rows retain their original shape and are plenty comfortable enough to hit the road with right away. Just as in the case of the exterior, some of the work has been done already - both the door panels appear to have been reupholstered along their top portions and youll find a pair of branded floor mats in place for protection in front. Better still, the expansive dash area is in surprisingly solid shape, with a straight, uncracked dash pad running across its considerable width, clear lenses protecting the gauges and every control knob and switch securely in place. An aftermarket AM/FM radio has been added and the in-dash vents stand ready to cool or warm the cabin as needed via the factory air conditioning thats still on board and running, but will likely need a simple a freon charge to bring it up to par. This droptops strong running condition means the good times behind the wheel can get started right away. Given its size, youd expect a sizable powerplant to be standing by beneath the hood and it certainly is. The 500 cubic inch V8 situated between the shock towers fires right up and is running strong. Its likely received a recent tune-up, and a number of maintenance items - including the distributor cap, spark plug wires and the spark plugs - look fairly new. The engine pairs with an automatic transmission thats shifting nice and smooth. The power steering is light enough to make this Caddy easy to navigate, while power brakes - with discs up front - bring its set of still fresh-looking 15 stock Cadillac wheels wrapped with Kumho tires to low-effort, dependable stops. The solid undercarriage below reinforces the notion that this classic is well-positioned to offer plenty more miles of enjoyment. 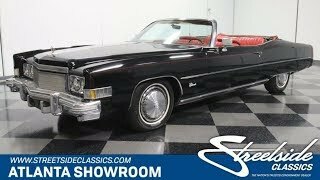 If youre looking to pull some serious mid-70s cool into your garage, you really need to check out this 1974 Cadillac Eldorado Convertible. Call today!